MODERN WOMAN ON THE GO! Feminine- elegant- practical- effortless- quality- slow fashion- luxurious- UNIQUE! 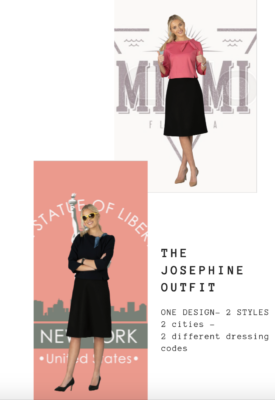 Versatile dressing with the Odelia top and 3 different Magdalena skirts. Posted on Tuesday, April 2nd, 2019 at 5:38 pm in Uncategorized. You can follow any responses to this entry through the RSS 2.0 feed. Both comments and pings are currently closed.